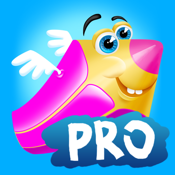 Kid's Art Studio Pro – Paint, draw, and play with no mess! *** 33% OFF FOR A LIMITED TIME *** Kid's Art Studio Pro allows your kids to paint on themselves or their friends without using any permanent effects! Take a photo of choose one from your library to begin. Click “More” to learn why you should download now! Animal icons: turtle, dog, horse, tiger, fish, penguin, elephant, zebra, rhino, giraffe, polar bear, camel, leopard, lion, hippo, koala bear, kangaroo, panda bear, gorilla, monkey, lizard, snake, dinosaur, and more! Object icons: truck, stuffed panda bear, baby doll, basketball, PlayStation 3, cell phone, remote control truck, baseball, soccer ball, hockey stick, bike, surfboard, Xbox, Wii, sword, piano, guitar, and more! Share your art designs: share in HD quality! Now it is time for your kid to let loose and start their art project. There are lots of pre-made icons to choose from in order to help create an artistic masterpiece. Then your kid can get out their paint brush, choose the size of the brush, choose the color, and begin painting using their finger! There are lots of pre-made kid-friendly icons to choose from in order to help your kid create their artistic masterpiece. You can share the new photo with your friends and your kid's friends on Facebook, Twitter, and email! Start being an artist now!